We are committed to the struggle against the endless, unjust wars waged by the United States, which destroy civil liberties, kill soldiers and civilians, and hugely benefit ‘defense’ contractors and other war profiteers at the expense of the working people of the world. We came together in the fall of 2002 during the lead up to the invasion of Iraq. 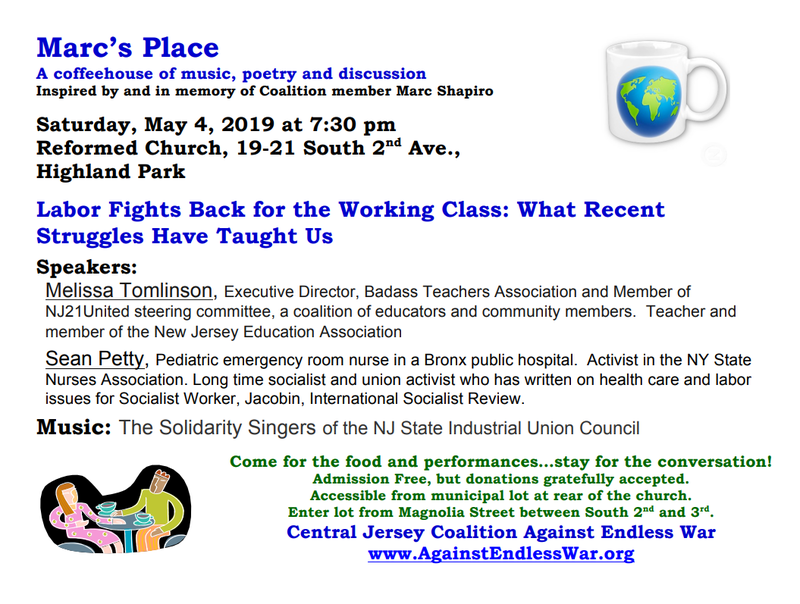 We organize vigils, protests, educational programs, coffeehouses, and legislative activities against the war in Afghanistan and Iraq, the threat of war against Iran and elsewhere, and the occupation of Palestinian territories. Through these activities, we also defend immigrants and civil liberties. We stand on the side of human rights and for racial equality and join with others working to end the current austerity drive, degradation of our environment, and attacks on human dignity. While we primarily organize in the Middlesex County area, we welcome all who want to participate in whatever way they can in our activities.